North side of the level crossing, on the lane branching off the B1340 a short distance north-east of Christon Bank village. Notes: This station was constructed close to the gates and drive of Fallodon Hall, one of the homes of the eminent Grey family, through whose land the railway passed. 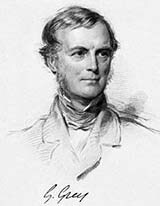 The most renowned member of the family was Charles, 2nd Earl Grey, who was British Prime Minister from 1830-34, and it was for his use that the station at Little Mill was provided, four miles south of Fallodon, and close to the other family seat of Howick Hall. By providing the station at Fallodon for the influential family the passage of the Newcastle & Berwick Railway Bill through Parliament was eased. The understanding was that this station would be private but that the general public could use Christon Bank station, a little less than a mile south of Fallodon. At the time of its opening, Sir George Grey (pictured left) was the proprietor of Fallodon Hall, and he held the position of Home Secretary in the Whig Prime Minister Lord John Russell’s cabinet. Grey was given the right to stop any public train at Fallodon. On the up (east) platform was a pent-roof stone shelter of the standard N&B design. Like the station house, the shelter carried ball finials. A siding was south of the crossing, east of the main tracks, but there was no goods depot. The station’s signal box was constructed by October 1877 on the down side of the tracks, immediately south of the level crossing. It was an NER N4 design with a brick base, initially equipped with a Stevens 24-lever frame, with two platform levers, of unknown function, for the private station. From March 1961 it was demoted to a gate box, released by Christon Bank. Fallodon box closed on 27 June 1967 when automatic half barriers were installed; they were supervised from Christon Bank, then when this box closed in 1974, the responsibility passed to Chathill. After Chathill box closed in December 1990 surveillance was by CCTV from Alnmouth. Fallodon signal box has been demolished. Fallodon station was always private, used only by the Greys, their guests (many of whom were distinguished members of society) and their servants. Nevertheless, NER nameboards were installed. The station was a drain on NER finances: receipts between 1897 and 1914 amounted to £600, whilst the stationmaster and porter cost £157 and £100 respectively each year. In 1914 only eighteen passengers were booked. The baronetcy of Fallodon passed to Edward Grey (pictured left) who became Liberal MP for Berwick and eventually British Foreign Secretary from 1905-16. He was briefly Chairman of the NER, and later of the LNER North Eastern Area Local Board. 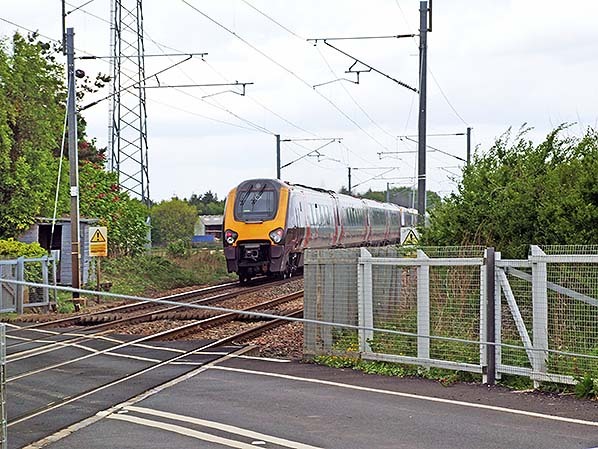 He showed responsible restraint in exercising the right to stop trains at his private station: faster expresses which did not call at Alnmouth and Belford were not inconvenienced, except in emergency. In 1898, in addition to ‘local’ stopping services, this effectively meant that four faster trains in each direction might call at Fallodon: these were the up trains departing Edinburgh Waverley at 10.20am, 2.45pm, 5.15pm and 7.35pm, and down trains leaving Newcastle at 6.20am, 9.30am, 12.20pm and 5.33pm. In 1907 when the stationmaster at Berwick chose to be helpful by arranging for one of the principal express trains to call at Fallodon for the convenience of a visitor to the Hall, the NER Operating Department took a dim view of the incident. In the midst of his responsibilities as British Foreign Secretary Edward Grey had the courtesy to write to the General Manager of the NER, graciously exonerating the Berwick stationmaster of responsibility, and confirming that guests at Fallodon should not expect principal expresses to call at the private station. During the 1920s the general public was lured from the railways by cheaper, more frequent, and generally more convenient bus services. More affluent members of society could now indulge in the luxury of motor cars. Nevertheless, Fallodon station remained in occasional use, and the accompanying poster advertises a half-day excursion from Berwick and some intermediate stations for supporters of the Liberal party to enjoy a garden party at Fallodon Hall on Wednesday 30 July 1930, depositing them at the station at 2.12pm and uplifting them at 8.30pm. Fawcett (1995) remarks that, as the country gentry were making much less use of any privileges they had to stop trains, the railways were keen to abolish this anachronism. 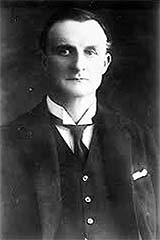 When Edward Grey died in 1933, and Fallodon Hall passed from his family to Captain and Mrs Graves, the LNER wasted no time in obtaining the couple’s consent to cancel their right to stop trains, in return for an LNER first class ‘all stations’ pass for life; this arrangement was agreed by the Traffic Committee on 15 February 1934, and trains ceased to call at Fallodon. After closure the station survived for quarter of a century, but by mid 1960 it had suffered ‘needless and unfortunate demolition’ (Fawcett). 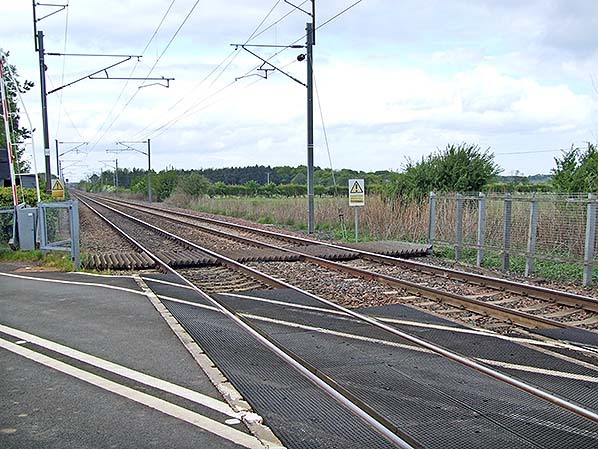 Although the buildings and platforms have been removed, the public road north-west of the level crossing has a lay-by corresponding to the ‘forecourt’ of the old station building, and on the site there remains a short section of wall. A modern relay room bearing a modern ‘Fallodon’ nameplate is immediately south of the level crossing. Route maps drawn by Alan Young. Tickets from Michael Stewart. Poster from Martin Bairstow collection. 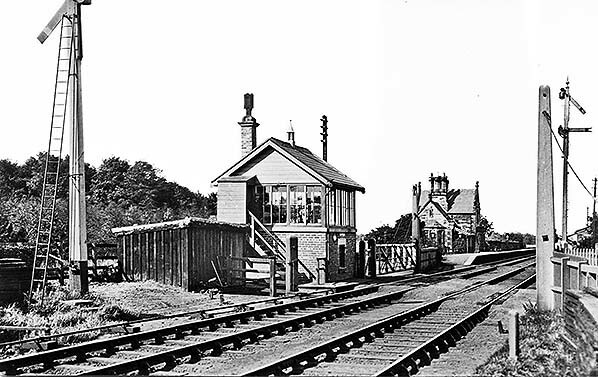 The signal box, level crossing and down platform at the private Fallodon station, looking north-west c1910. The signalman is standing proudly at the top of the steps of the brick-built signal box: many of the NER boxes on this line were constructed of stone. The N&B station building is in the background. 1867 1:2,500 OS map. Fallodon station is named, but with no indication that it is private. The main building on the west (down) platform has a forecourt only yards away from the tree-lined drive to Fallodon Hall; East Lodge stands at the entrance to the drive. The east (up) platform has a smaller waiting shed. 1897 1: 2,500 OS map. Fallodon station is now, correctly, indicated as ‘Private’. Since the earlier revision of the map, a siding has been laid south of the level crossing, on the up side, and a signal box (not named) has been added on the down side, again south of the crossing. The grounds of Fallodon are now shown to be wooded. 1923 1: 2,500 OS map. Little has changed since 1897 but ‘Private’ has been removed from the station name even though it was still exclusively for the use of the Grey family, their servants and guests. 1957 1: 10,560 OS map. Fallodon station ceased to be used in 1934, yet this map published 23 years later gives no indication either that it was private or that it has closed. The main building, west of the railway, is still shown, but the waiting shed is not; the shed was never shown on OS maps of this scale. Some of the woodland in the grounds of Fallodon Hall has been cleared. 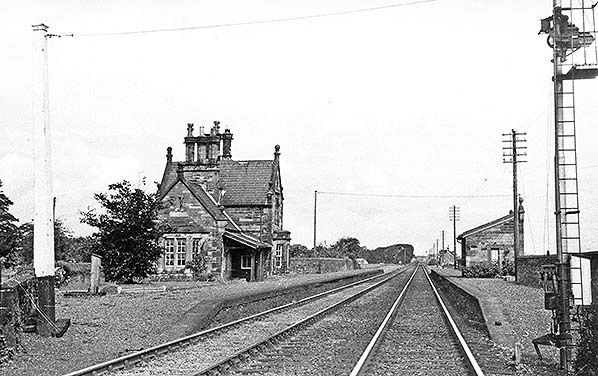 Fallodon station building in 1906, shortly before the upper-storey extension was constructed. Details of the structure including the verandah, quoins, window surrounds, raised gables, ball finials and chimneystacks are shown clearly on the Tudor/Jacobean building constructed for the Newcastle & Berwick Railway in 1847. Fallodon station, looking north-west c1930. Although it was always a private station, the North Eastern Railway provided one of its standard running-in nameboards. The station building is unmistakably of Newcastle & Berwick Railway origin. The sandstone ashlar structure has canted bay windows on the ground floor; the pitched slate roofs have raised gables, with decorative ball finials placed on the apex of the gables and on the kneelers at either end of the gables; and stately chimneystacks complete the composition. The coiled serpent bench and the oil lanterns are typical features of NER stations. The purpose of the lever beneath the nameboard is not known. 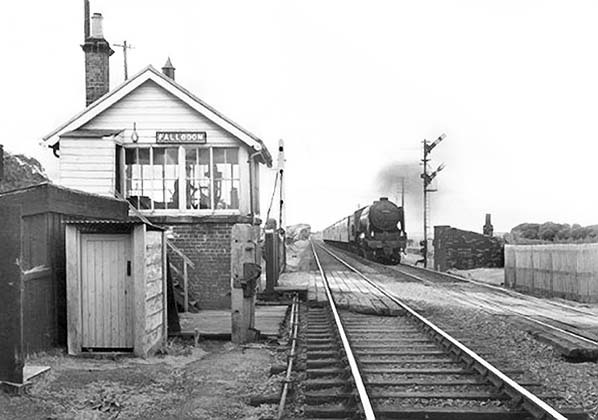 Considering that Fallodon station has been closed to all traffic for over 20 years, this photograph from 1958 shows it to be in a remarkably good state of repair. In this view north from the level crossing the two platforms are in place, and both the station building on the down (left) platform and the waiting shelter on the opposite platform have survived. The two buildings are typical of the Newcastle & Berwick Railway station architecture, and their complementary design and location directly facing one another make for a pleasing composition. The Newcastle architect Benjamin Green designed the fine ‘Jacobethan’-style buildings for the company’s stations, and here at Fallodon the facilities were suitably dignified to cater for the exacting requirements of the Grey family and their guests. In the distance, to the right of the railway, the railway cottages at Brunton Crossing can be seen. In June 1960 A2 Pacific ‘Hycilla’ draws a train of Pullman stock south through Fallodon. The station which stood beyond the crossing appears to have been demolished, but the NER signal box remains in place. The Thompson-designed 4-6-2 locomotive was built at the LNER Doncaster works in November 1946. She was withdrawn from 50A, York North shed, on 12 November 1962 and was cut up at Doncaster works in April 1963. 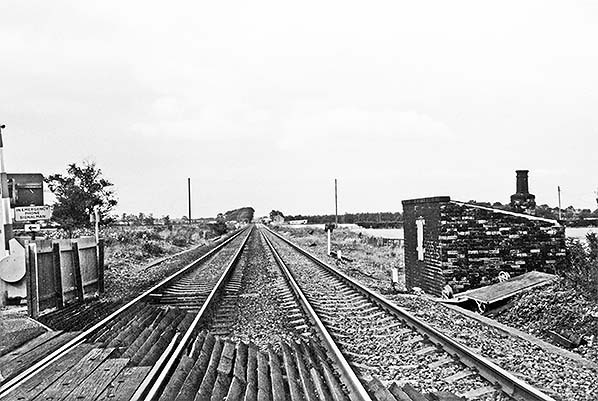 Looking north from the level crossing towards the site of the private Fallodon station in September 1978. 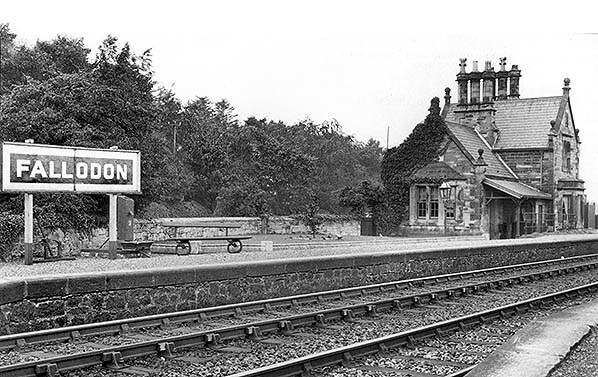 The platforms, station building and waiting shelter were demolished early in the 1960s. The only building is a platelayers’ hut, immediately south of the site of the up platform ramp. The crossing gates were replaced with automatic half-barriers over ten years before the date of this photograph. Looking north from the level crossing at Fallodon in May 2009. The up (east) platform of the former station was between the first and second posts supporting the electric wires. Nothing remains of the station today.